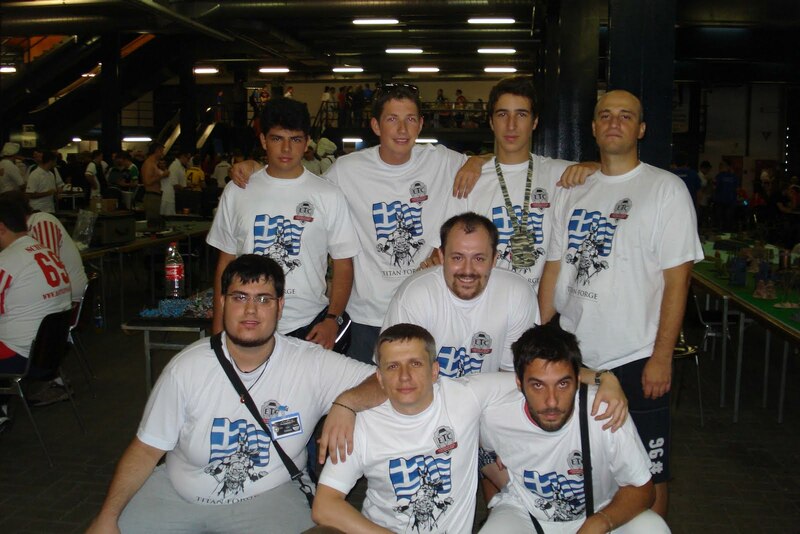 From upper left to right: Takis Mahos who played the Imperial Guard, Marcin Narewski with Witch Hunter and Imperial Guard Allies, Odysseus Charalampopoulos ‘Khorne’ with Chaos Daemons, Leonidas Fragkos-Livanios ‘Moskitokiller’ with Dark Eldars. Middle row: Roman Lakomiak with his space wolves. 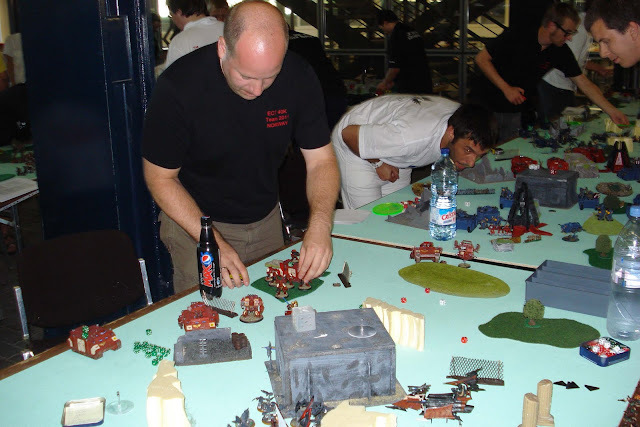 Lower row, from the left: the captain, Stefanos Kapetanakis ‘Blood Guzzler’, playing Tyrranids, Milosz Dziembowski with Orks and Vasilis Apostolopoulos ‘Billap’ with Blood Angels. Troops1: 9 Wyches (90); Hydra Gauntlets x1 (10); Haywire Grenades (18), Hekatrix (10), Phantasm Grenade Launcher (10), Venom Blade (5) in transport 1 . Troops2: 9 Wyches (90); Hydra Gauntlets x1 (10); Haywire Grenades (18), Hekatrix (10), Phantasm Grenade Launcher (10), Agoniser (20) in transport 2 . Troops3: 9 Wyches (90); Hydra Gauntlets x1 (10); Haywire Grenades (18), Hekatrix (10), Phantasm Grenade Launcher (10), Agoniser (20) in transport 3 . Troops4: 9 Wyches (90); Hydra Gauntlets x1 (10); Haywire Grenades (18), Hekatrix (10), Phantasm Grenade Launcher (10), Agoniser (20) in transport 4 . Transport 1: Raider (60) Enhanced Aethersails (5) Grisly Trophies (5) Flickerfield (10) . Transport 2: Raider (60) Enhanced Aethersails (5) Grisly Trophies (5) Flickerfield (10) . Transport 3: Raider (60) Enhanced Aethersails (5) Torment Grenade Launchers (5) Flickerfield (10) . Transport 4: Raider (60) Enhanced Aethersails (5) Torment Grenade Launchers (5) Flickerfield (10) . First match for Greece was against USA. 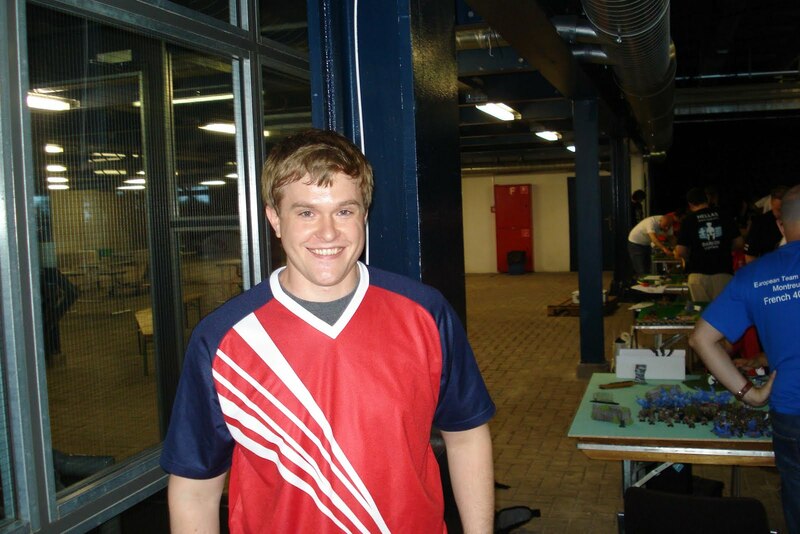 My first opponent was the USA captain Ben Molly who plays Space Marines. 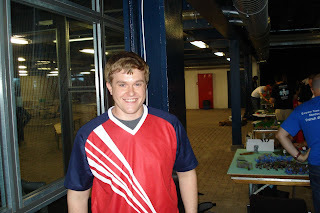 Ben Mohlie, Spacecurves, the captain of the team USA. His list had a Librarian, 5 termies with hammer+shield, 1 autocannon dreadnought, 1 naked dreadnought, 3 tactical SM squads with missile launcher and flamer or meltagun, two in razorbacks, one in rhino, 2 speeders with missile launchers, one land raider and Thunderfire cannon. Primary objective: Annihilation. 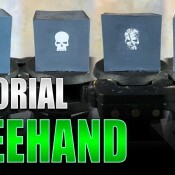 Secondary objective: Capture & control. I lost the die roll for playing first. Ben had chosen the table as a defender, and he chose the table quarter with a big three-level ruin and placed his base behind it. I placed mine on an area terrain near the corner of my quarter. 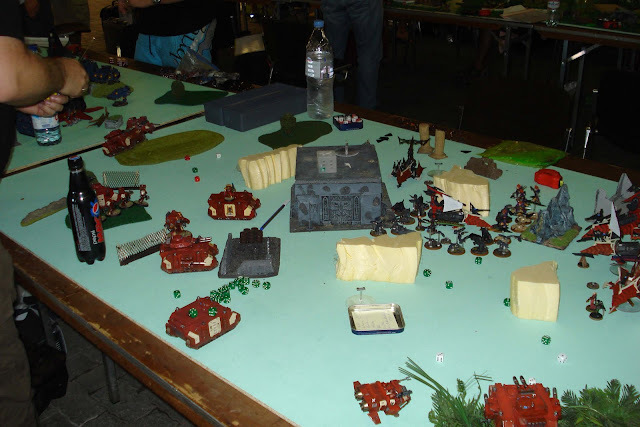 He stacks all the models on or behind that massive piece of terrain except one razor that he placed near the middle of the long table edge opposite to me. Ben starts his movements but then I remember that I did not try to seize initiative. Being a real sport he let me roll without hesitation, winning the sportsmanship champion award in my heart. I seize initiative! Turn 1: I rushed everything forward as always. The ravagers were mostly out of range. The raiders passed the middle line closing to the opponent’s base. The beast moved and ran. The closest razor gets stunned.SM reshuffles the force in and behind that area terrain. He shoots down one raider and one ravager. Turn 2: I closed even more on the 2nd turn and assaulted his tactical squad on the middle line. Turn 3: The warpbeasts still approaching. They get zero damage from the consecutive opponents round of shooting. My wyches assaulted and wreck a razorback. All raiders down except one. Null Zone is nullifying the flickerfield. One unit of wyches is blown up completely. Turn 4: Shooting with my last ravager. Assault the closest dread - not a clever move. 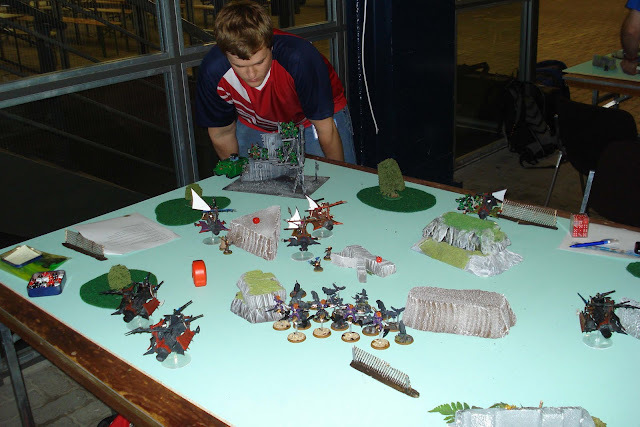 The wych squad that killed the razor squad in the middle of the opposite table edge walks and runs back to my base. Ben did his counter attack on that turn and basically mopped my units out of his quarter. He shot with the speeders, the devastators and the cannon and the dreagnhout, on the two wych squads and the beasts. Turn 5: One wych squad and the beast still running kited by the damaged SM speeder. My walking wyches are directed back on my base and get an ace on the run! The two consecutive sort run rolls and the broken beasts sealed the outcome. The game stops at round 5 – Ben rolled a "2". My wytches were 7 inches away from my base. Should we have one more round I would have 2 more points but nothing more than this. I only managed to get 3-4 kp, so he won the primary. I was not on my base so lost the secondary too and he got 1456 vp to my 360. 19-1 the final score. Thoughts: I could have played conservatively and keep my forces back, hold the base, shoot with my 13 lances and go for the draw. However, if I wanted to stay faithful to my tactic of massive frontal assault I should have kept all 4 units of wyches together and go for the base of the opponent en mass. It could have been a bloody battle but could have gone my way. By splitting my force I became weaker. The only thing that might have been affected by bad luck was the run rolls; I didn’t score more than 3 on the runs for two rounds, making all my wyches and the beasts so slow that they never made it. Great lesson of tactics and strategic composure by Ben, who was at least two classes better than me. I was really happy with the pairing and yet got slaughtered. I still cannot understand how the hell he can have more than decent results with this lists, which I called ‘GW advertising list’, since it reminds me of the irrelevant lists published on the GW site. I think he exploited terrain to the maximum. If there was of point of disagreement with Ben that was an instance when my assaulting wyches reached bellow the devastators and Ben said that they cannot get to assault, on turn 4. It was a crucial point, the assault never happened and the wyches died. I still think that they were well within reach but now it’s over. The other thing was the deployment. Ben made 16 minutes to deploy and more than 10 minutes to decide where to place the first model!! Huge contrast with my 4-minutes deployment (Ben complemented me on my fast playing). Apparently he was calculating exactly the distances and terrain. I realised that the worst way later on the game. No matter what, I could not get more than 16-4 on this game. Those minute points cannot even cloud an amazing performance and a first class sportsmanship on his behalf. It was this aspect that made me vote for USA for sportsmanship at the end. The overall friendly and athletic behaviour of the American team made me reconsider any anti-American feeling I might had (I never understood why we allowed Americans to join the EUROPEAN championship, but anyway. Guys you left Europe with Colobus and break ties with your Independence and Gearge Washington. Why coming back now?). Well done guys and congratulations for your 3rd place. Well deserved. I was asked by my captain to play the GK player and I agreed. It was Andy 'Andy10k' Oakham. Andy Oakham, Andy10k, smoking by the lake side. He had 3 autocannon walkers, one Inquisitor with assassins in a land raider, a second Land Raider 2 units of 5-men Grey Knights in TL Las-razorbacks and 5 GKs on foot. It was a list I could face. The mission was Deployment: Dawn of War. Primary objective: Capture & control. Secondary objective: Seize Ground (4 counters).I was playing second. He places two empty razorbacks on the table! I did not know that you can deploy empty transports and keep their unit behind. But the judge said it is legal. You live and learn... I put nothing on the table. Turn 1. He occupied the centre and the right side of his deployment zone. I get in with aethersales and I am in his face with my four raiders. The beasts move and run. The ravagers manage to shoot despite the night fight but did not do much. One stunned and one weapon destroyed on one of the dreadnoughts. I open the crucible – he has -1 at his leadership yet he passes for the two walkers and the razorback. The land raider had no penalty yet he rolled 11! The raider with the inquisitor and the assassins is out! This was the only time I would get that joy, since the new DE FAQ denies the use of the crucible on vehicles. But the ETC clarifications came out two months ago and they allowed it. Thus I had a lucky and successful first turn and everything was going according to plan. Turn 2. Very limited move by Andy. He immobilise one ravager, do some damage on one of the raiders. Again I rolled successfully and manage to save my closest raider 3 times on 4+! Andy is getting stressed. I move on, disembark and shoot. My shooting on round 2 does almost nothing. I reach the closest razorback and the unit on foot on the right side of his edge and the razor on the middle. The razor is wrecked, the assault is a draw. I made a grave mistake thought. I forgot to leave the heamy from one of the units on the raider. A huge mistake. I miss the assault – they had run. That would prove quite crucial later on the game. At two separate occasions – on this turn and the next- Andy said to his captain that ‘I got him by the balls’. Then everything changed. On Turn 3, Andy tank shocked the closest of my non engaged wyches. They lost the Morale check twice (re-roll from grisly trophies) and they break. Then another unit is charged by a strike squad. They hold initially but they loose on my turn for one (Andy says for more) and they break as well. Turn 5. Andy herds the 4 units out with a semi-demolished razor. Shoots at a ravager and can’t remember what happens. I have very little to do. Move the last heamy somewhere and shoot with the ravagers. I think I did some damage on a walker. (at that point I was already I a state of post-traumatic shock and cannot remember much. It is this protective state of mind that blocks out things that we do not want to remember). At round 5 I made a mistake: I forgot to roll for regrouping on the wych squad that was running from shooting. I thing it was not close to the damned herding razor. But that would have done little, probably +1 point on the final. Andy did not realise that, cause I am sure that he would have remind me to roll. I realised it later on when I was cleaning the table. (Andy remembers that they were below half strength. Maybe he is right). I do not remember if there was a 6th turn. Maybe there was...It would not make a difference. Another cloudyspot is Andy’s second land raider. I remember a stunned result but nothing after that. At the end, he got his base, I did not. He got one objective, I had none and he got more than 1600 vp and I had a little over 900. 18-2. Thoughts: I do not think that my strategy and tactics were wrong. It just happened. What happened on that table was something that I had never seen before in a game. What are the chances of not getting a single wound on 3 different battles? What are the chances on breaking 4 times in one turn on 9+, 8+, 8+ (with re-roll) and 7+? I never whine about luck and the gods of dice but this could have happened on a friendly match, not on the ETC finals! After the game I was in a state of shock. Apart from fate however, I made a couple of mistakes: keeping one heamy with the girls twice stopped me from assaulting. Also, I would say that the positioning of the warpbeasts was not the best one, so they ended up fighting with a walker instead of something they could handle. Andy was superb, never making a single mistake and, being a good general, he took advantage of all the features of the terrain as well as my weaknesses. His initial deployment was clever. He had the walkers to support each other and the distances between the units were not to close, therefore I was forced to concentrate on the centre, leaving his right flank. More importantly, he coped really well after his stroke of bad luck, when he lost his land raider with the inquisitor and the assassins. We were placed against Norway. Deployment: Pitched battle. Primary objective: Seize Ground (5 counters). Secondary objective: Annihilation. I played with Andreas Orlyng. Andreas Orlyng, the Norwegian Black Templar. He had Templars with Emperor’s Champ, Venerable Dreadnought, Termies with 2 missile launcers, 4 land speaders with Typhoon Missile Launcher, 3 full lascannon predators and 3 crusador squads in rinos, 2 of them with melta+multimelta, one with plasma and lascannon. He wins the roll and goes first (what a surprise!). 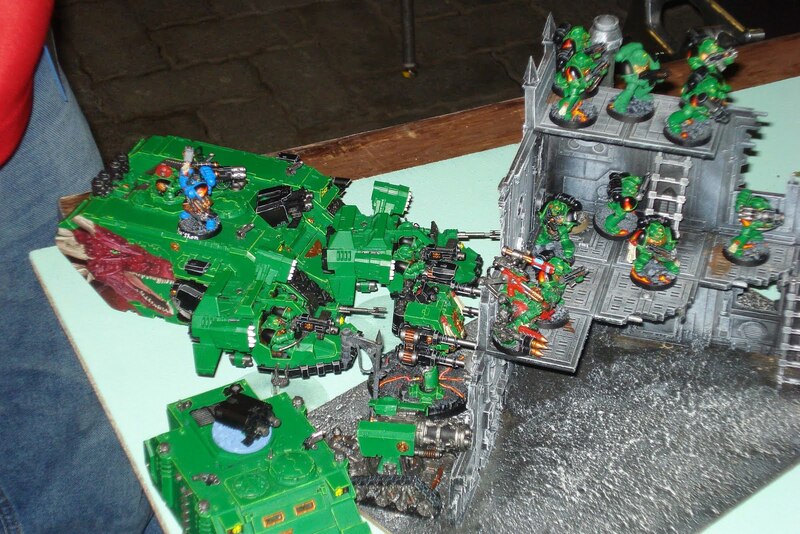 He deploys in an open formation with a predator located in the woods on his right hand and the termies with the 2 launchers + a second predator inside an area terrain on his left, 12 inches from the left corner. By going first he got the side with the best cover and he capitalised on that. Everything else was in between. 3 speeders on the left, 1 on the right. He did not know it but with such an open formation he was giving a hard time to the united frontal assault I was planning. At that moment I decided to play differently. I deploy on my right side leaving the beasts near the centre, everything else hidden or at the left. There was a tall ruin in the middle so I took full advantage of it and hide the 2 ravagers. I kept the 3rd on the right to go for that single predator. Turn 1. He shoots down a raider. I immobilise the predator on the left. Movement with wyches on foot and small advancement on the raiders. Turn 2. Andreas brings forth his speeders. Minimal movements.Weapon destroyed on ravager and immobilise a raider. I shoot down a speeder and stun another. Disembark a wych squad and closed in on that immobile predator. Turn 3. Andreas moved the walker and the right side rhino closer to the middle. One ravager down and some wounds on the walking wyches. I walk and get the further objective to my left. I would keep it until the end. The beasts are closing in on the rhino near the centre of his deployment zone. I stun a predator and destroy another speeder. Turn 4. He is attempting to flank my right wing. Shooting on the beasts with the walker, does nothing. I get wounds on one wych squad, the one on the middle objective. They hold. One more raider down. I move in and assault the predator. Shoot down the last of the three speeders on my right. I assault the rhino and wreck it the unit inside is gone, since I had surround it. The predator is wrecked as well. A very good round. Turn 5. Andreas knowing he is losing at that point close in on my right flank. He has one predator and one rhino with the Champion 12 inches from my central objective. He moves the walker closer to the beasts and shoots. Minimal damage. A second ravager is wrecked from the shooting termies, I think. I rearranged my wyches and I had two of the objectives. Shooting did nothing. I engaged the walker with the beasts to stop him from getting too close to my wyches that hold the central objective. The whole game was played around that objective. My assault did nothing on the walker. He did nothing to me either. He rolls for the continuation. He rolled a 2. The game stops here. We were both quite tired. We shared the victory points and the objectives (2-2) but he had 7 kp to my 6! For that single kill point I lost 2 points. The match was seriously balanced. It could have been 12-8 for me or a clean draw. Andreas had the courtesy to offer his report. So here it is. My Black Templars army is very sensitive to a death star type matchup and even though my team captain knew this I got matched against a fast Dark Eldar army with a Beastmaster Death Star unit. I knew that a win would be very hard for me so my team and I decided that I would play for a draw. 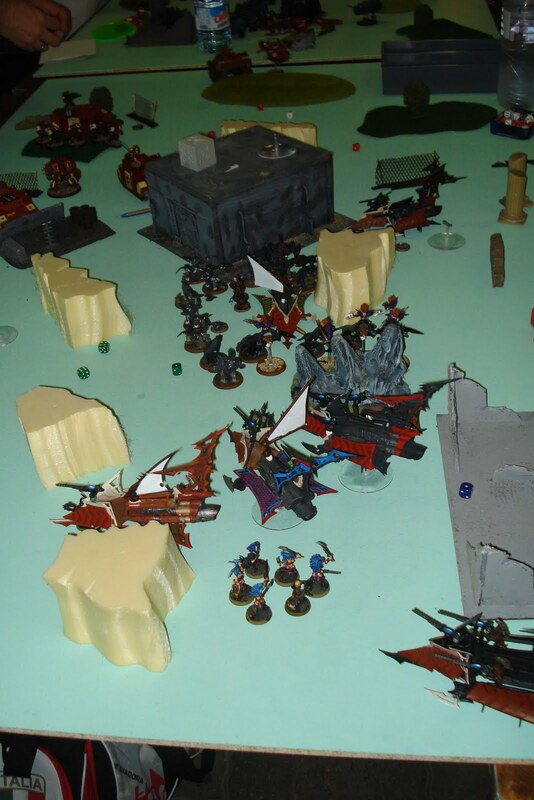 I deployed as spread out as possible both to maximize shooting and to make the Dark Eldar walk for a turn or two between each of my units thus further maximizing my shooting and minimizing my losses. There were several reasons for me choosing the side I did, one was cover but the other reason was in fact that three of the five objectives were on the other side. This might seem like an error but in fact I hoped that it would tie up three units of Wyches which in fact it did. My shooting in the first two rounds were pretty bad so it looked more and more like I would loose. However with the deployment, cover and a very good round of shooting in turn 3 I was back in the game. I still had no real answer to the Beast Master unit now rampaging in my middle but everything else on the table I felt I had control over. All the transports were dead or far away and the ravagers were gone as well. One stroke of luck was that the Beast Master unit failed to destroy one of my Rhinos forcing two additional rounds of CC. On turn 4 I had to make my move if I wanted to be sure of drawing the game or perhaps force a win, I rushed the Emperors Champion rhino, one of the Predators and the last remaining Land Speeder towards an objective defended by a Wych squad and poured fire into it. I was prepeared to use the EC to kill the squad if neccessary but they broke and due to my proximity they would play no further role in the game. At this point I knew I had a draw unless the Beastmaster unit charged my Terminators and LasCannon squad on my objective. When they charged the Venerable dreadnought I was very relieved. The Beasts had almost no chance of killing the Venerable Dreadnought barring extreme dice rolling. However the game ended in turn 5 before I could capitalize on the situation and I got a 12-8 victory. I feel that if the game had continued I would probably have gotten the primary objective as well due to superior firepower and contesting vehicles. I deployed and fought a decent defensive game. One big mistake was that I wasted quite a bit of shooting in one turn on the Beast Master unit when I couldnt do much against it. If I had consentrated on the Wych squads I would most probably have wiped out one more. My opponent did, in my opinion, three mistakes that probably cost him the game. He fought defensively the objectives in his deployment zone with an assault army. This effectively nullified three of his Wych squads. He sent one Wych squad against one of my Predators, deployed alone in a corner, thus effecively nullifying this Wych squad as well. He also charged my Venerable Dread with his Beast Master that would most likely tie them up for the rest of the game. All in all the battle was close fought and tense, my opponent was a pleasure to play against. Thoughts: Andreas was a very quiet and calm opponent. He played very cautiously and he made me play that way too. In this game I did not try my famous ‘all or nothing’ full frontal assault. And it went well. Still his list was far more shootier than mine so he got the extra kill points to get a victory. Damned ETC scoring system! Thinking about that game now, I recon I was a bit scared of Andreas and he got a bit scared of me. 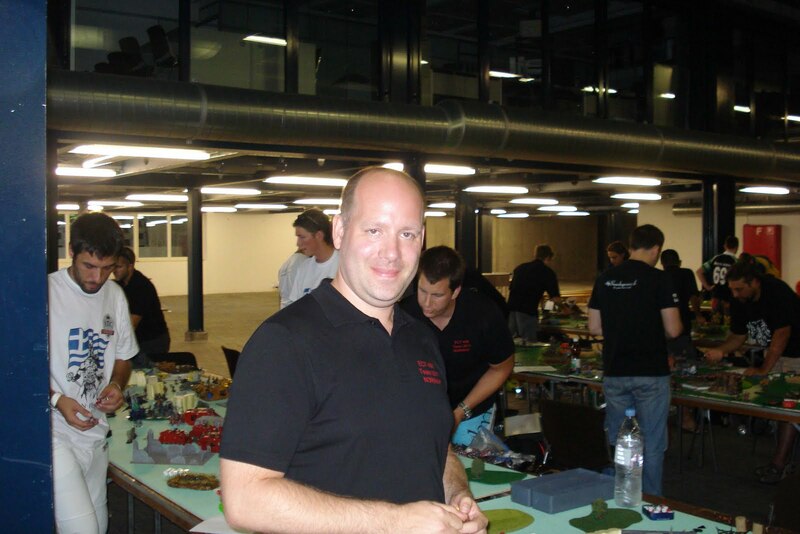 That was the first day at ETC 2011 for me. I got 3 defeats. Same as my team. I cannot complain about the pairings. All 3 opponents seemed playable. With a few changes and a bit of luck games 2 and 3 might have been way different. My opponents were more composed and definitely more experienced than I was. I am forced to mention that I lost 3 times the dice for getting first.At least I seized the initiative once. What can I say, I am so jealous. I wish I could have been there even if I lost all my games. I am sure Leonidas with some proper practise will do much better next year. I would also like to thank Andreas Orlyng for his own side of the coin with his battle report. Nice battle reports, good that we saw some more information about the gaming of the opponents, Leonidas seemed to be able to win the games but had bad luck, with some more of it (luck) and more training he will do much better next year. Good read and it definitely sounds that a couple of times you were plain unlucky. Like Lefteris says more practice on how to play at the ETC as a team rather than as in a singles tourney, will no doubt do wonders for you guys.